In a recent Pottery Barn catalog I saw a wonderful display of frames hanging from boat cleats. As many of you know I have been slowly working a nautical/pirate theme into my middle son’s room and I loved the idea of making him a sign and hanging it from a boat cleat! Once it was dry I used a staple gun to attach some boat line to the back of the sign then hung my cleat on the wall and looped the rope around! Nash loves it (he picked out what it should say) and its the perfect compliment to his Pirate Sail Headboard and Pirate Desk! Just below the header you can see the different pages of the blog-I’ve added a DIY Gallery with thumbnail links to my projects so you can see them all at a glance-it should make finding what you are looking for much easier! If you look over on the right sidebar you’ll see two new areas as well. The first is an About Me box that you can click to learn little more about who I am. Below that are all the ways you can keep in touch with me- Pinterest, Facebook, RSS, and yes, even Twitter. Please people-help me with the Twitter thing, I’m still learning it and would love to have more of you on there to interact with! There’s also a new button on the sidebar to match the new look so feel free to grab one! I hope you all have a wonderful weekend-my oldest starts kindergarten on Monday so I’ll be wistful next week I’m sure! Wish me luck! How creative! I love it. The font for the silhouetted text is perfect. This turned out great! I just love some good Pottery Barn inspiration, you nailed it! Thanks so much for stopping by little corner of blog land! So nice to “meet” you! What a super cute idea! And I love that the exclamation mark is a cutlass 🙂 Thanks so much for sharing this at The Fun In Functional! Without sounding like a cliche…”shiver me timbers” that is so cool!! 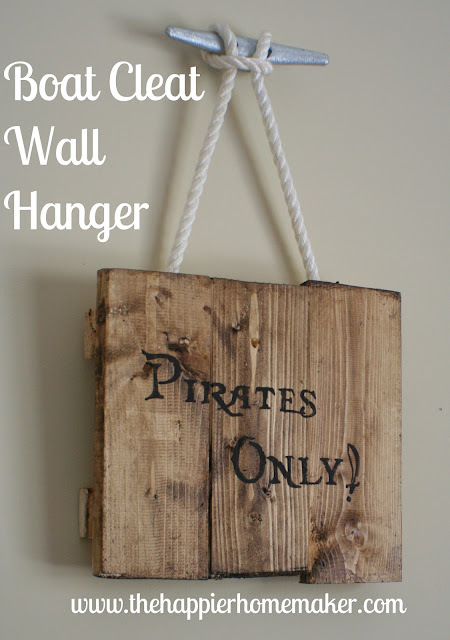 It will be a great idea to hang things in a beachy or nautical themed home/cottage. TFS!! Stopping by HoH linky party and your newest follower.